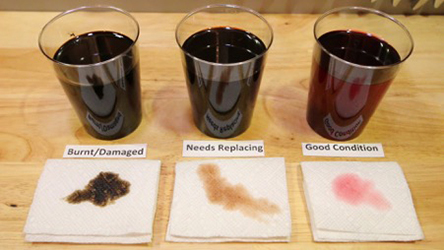 There is an underlying issue in many Audi and Volkswagen models built between 2008 and 2015 that if left unchecked could result in very expensive engine damage. The engines affected are the 4 cylinder TSi engines in both 1.8 litre and 2.0 litre variations. The risk is that the lower hydraulic timing chain tensioner may fail, later model vehicles with the fitment of these engines have a revised timing chain tensioner which has removed this risk from the engine design. 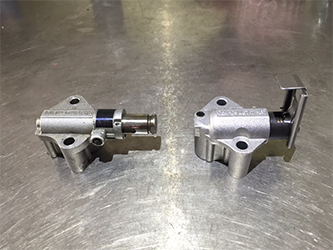 Above is a photo of the two timing chain tensioners, the unit on the left is the tensioner prone to failure and the unit on the right is the revised tensioner. What does a timing chain tensioner do? For your engine to work properly it is critical that the moving parts within the engine work in perfect time with each other. 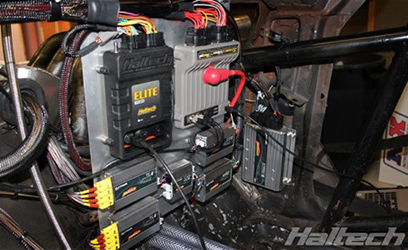 The component in control of this task is the engine timing chain and the timing chain’s associated components. One of these associated components in charge of keeping a critical tension applied to the timing chain is the timing chain tensioner. 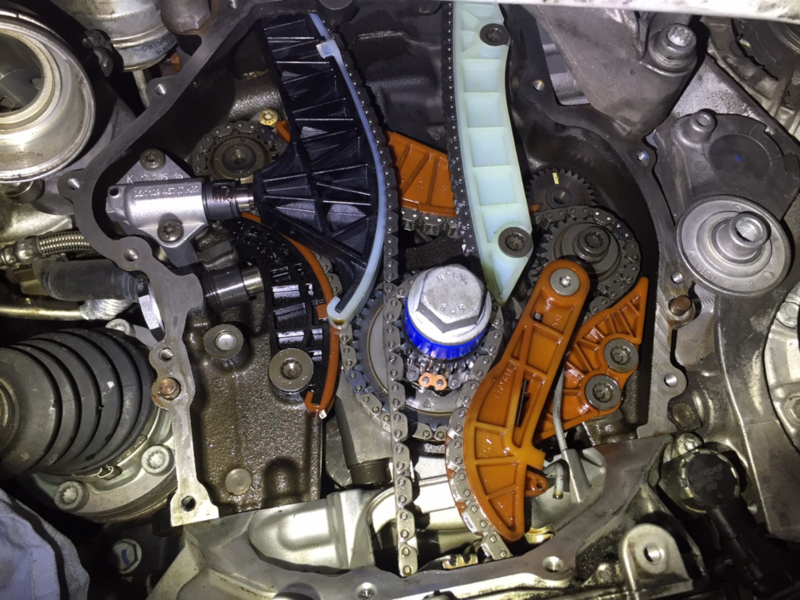 The timing chain tensioner is basically a hydraulic ram, when the engine is running oil pressure in the engine is fed to the tensioner and this pressure forces the timing chain tensioner piston against the moving timing chain. By doing so all the slack in the timing chain is taken out and ensures that the timing chain will not jump over spocket teeth and put the engine out of time. What goes wrong? When the engine is started and oil pressure is fed to the timing chain tensioner the piston is pushed hard against the moving timing chain, but when the engine is switch off there will be no pressure to hold the timing chain tensioner in place. To combat this there is a mechanical ratchet that forms part of the tensioner unit and this ratchet hold the tensioner against the timing chain when oil pressure is no longer present (the engine has been turned off) This ratchet assembly is the fail point in the early design tensioner. When the ratchet fails the piston applying tension to the timing chain can fall back away from the timing chain and suddenly there is a huge amount of loose timing chain present. The real problem here is that this will usually occur when you have turned your engine off. The next time you start your vehicle all symptoms are present for the timing chain to jump out of time as you crank the engine over to start it. If the chain does jump there is instant and considerable internal engine damage. Because the engine is out of time the pistons collide with the valves in the cylinder head and bend or break them. The engine will no longer run and the repair cost is in the proximity of $4000 to $5500 depending on the extent of the damage which can only be assed when the cylinder head is removed from the engine. How do I know if I am at risk? Certainly, if there is any rattling noise from your engine have it assessed immediately. However, if your engine is quiet that does not mean that all is well and you may have the suspect tensioner fitted to your engine. To put your mind at ease the best thing to do is have the engine inspected and fortunately this is not a big job to inspect. There is an inspection port on the front of the engine that is fitted with a plug which can be removed quite easily to identify which timing chain tensioner is in place. If the latest model timing chain tensioner is in place then all is well, we fit a new plug to the inspection port and you can rest easy. If your timing chain tensioner is the type that is suspect to failure we can replace it for you to the new tensioner. We keep the parts required in stock and the procedure usually takes around 5 hours. This remedy is most certainly a whole lot less expensive than repairing the engine after a timing chain tensioner failure. Below is a photo of the new revised timing chain tensioner fitted into place on the left hand side of the engine.